Camaron Rebosado is a Filipino Traditional dish. This dish is a Filipino counterpart of the very famous shrimp dish tempura of the Japanese because they have the similar way how to cook it. Batter and shrimp are the key ingredients for this dish and making the batter depends on how you want to make it. 1 Remove heads and shells of the shrimps but leave tails intact. Make sure you remove the black intestine by slitting halfway the back of the shrimps. 2 Marinate shrimps in calamansi and salt. Set aside in the refrigerator. 3 Meanwhile, prepare batter by mixing eggs and flour in a mixing bowl. 4 Carefully and gradually pour water, blending it well with the mixture, until you reach your desired thickness of consistency. Salt to taste, then set aside. 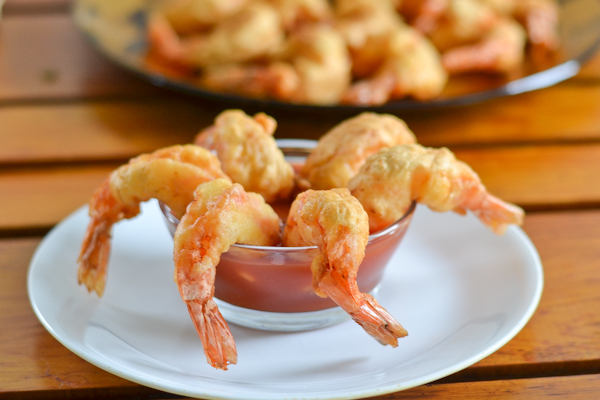 5 Dip shrimps in batter, and then deep-fry in hot cooking oil until golden brown. 6 Strain and dry in a platter with paper towel. Serve hot with sweet and sour sauce or catsup.